I learned so much about design and manufacturing while doing this internship. In school we always designed for optimum efficiency and we never considered how the parts would be manufactured and if the design was even probable to manufacture. While working at the center, it forced me to design for manufacturing. While designing the parts, I had to use raw materials from a content center on the 3-D modeling software that forced me to think about how each piece could be created. Working at the center has definitely prepared me for projects I will design and build in the future. I also really enjoyed all the hands on work that I was able to do. The arrangement of working in the office and on the computer in the morning, then working out in the shop in the afternoon allowed me to stay focused and interested in my project. So much directly under one roof! Our multidisciplinary group from California was joined by a student team from Australia to work on projects that affect communities around the world. Truely a once-in-a-lifetime experience! Work was challenging and allowed for creative thinking and new ideas. The homestays were indescribable by how welcomed, safe, and loved I felt. There's no better way to experience any culture. I learned so much beyond the engineering skills I acquired. We like interns to gain some good work-life experience, build some confidence in applying their education, gain some appreciation for village life and a different culture and accomplish something useful for villagers and the CVBT. We want their time at the CVBT to be positive and pleasant for them and the villagers they work and live with. The CVBT is a not-for-profit organization and currently has no funding for intern stipends. 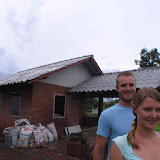 Interns stay with rice farmer families in nearby villages. Interns are asked to contribute 5500 Baht per month for room and 3 meals per day. The CVBT has some bicycles and cell phones (including a cable for internet connection via cell phone) for interns to use. Interns are accepted from all countries without discrimination of race, creed or gender. We have had interns from Thailand, Australia and the United States. To apply, send an email to cvbt@cvbt-web.org Please write about why you'd like to do an internship here, what your interested in doing. Include your CV (resume), transcripts (unofficial is OK). We want to make sure that the CVBT and you are a good match; that we have projects and support for you and your work. We prefer a commitment of a minimum of 10 weeks including 2 weeks of vacation. This is also a commitment on the part of Geoffrey to provide supervision and support for 8 weeks. Ten weeks is a good amount of time to become acclimated, learn some things and finish a significant project. The CVBT has 4 computers and has the following software: Microsoft Office and Project, AutoCAD, Mechanical Desktop, Inventor, Architectural Desktop, D StudioViz; Adobe Acrobat, Pagemaker, Illustrator and Photoshop, Rbase, Drupal and Filezilla. Basic Civil Engineering lab equipment is available including concrete compressive strength test cube molds, sieves, a balance and a soil block compressive strength tester. Our shop equipment includes a pretty comprehensive set of hand and power tools as well as a grinder, drill press, gas and arc welding equipment and a metal lathe. We have pretty much everything to handle metal, wood and plastic working as well as electrical work. We have measuring equipment for many things. There are dart, Frisbee, volleyball, takraw, badminton and ping pong equipment as well as a kitchen, solar dryer and solar oven.